It's Oscars weekend! I love the Oscars. I have been watching since I was a little kid, every year brushing up on my acceptance speech, just in case. This year, I decided to bring that excitement to the blog. As most of you know, I made a resolution to see each nominated film before the awards show. It was the first year I have ever done this, but I think I'll try to do it again in the years to come. I finished them all, save for one, the foreign film, Amour. It was only in select cities and none of them are in southern Alabama. I really want to see it too. I love foreign films, especially ones in French. This movie received rave reviews, but in my opinion, if it's nominated for Best Foreign Film, how fair is it really to also nominate it for Best Film? I think it's pretty obvious that it will win Best Foreign Film though...how funny would that be if it didn't. Anyway, today I want to share my picks and predictions. The asterisks are my predictions, what I think the Academy will select. For the record, I didn't see The Master or The Sessions, and those are both great actresses, but I have to say Anne Hathaway (as annoying as I think she is) moved me more in a four and a half minute song than I thought possible. However, I wouldn't mind seeing Jacki Weaver take it with her performance in SLP. "I'm making crabby snacks and homemades!" Loved her. No doubt in my mind, Christoph Waltz is taking this one. I enjoyed every line he spoke and every second he was on screen in Django Unchained. He was funny, moving and original. Can I give his accent an award? I predict Jessica Chastain will win this one because Zero Dark Thirty has to win something, and she carried that movie. However, I want Jennifer Lawrence to win this one because I think it would mean something astounding for her. I want her to remain that artistic, well-respected actress even though she's in a pop culture hit (THG). I don't want to see her throw away her talent to be rom-coms and action flicks. Have you seen Les Mis? What Hugh Jackman did in that movie was super human. I have a feeling DDL will win this one, and I won't lie...I"ll be disappointed. He did a great impression of Lincoln, but he just didn't move me like Jackman did. I almost didn't make a prediction for Best Director because I still don't understand what a director does. If there are categories for music, writing, acting, editing, mixing and special effects...then what is left for the director do? I guess it's his vision, right? I'm no expert, but I'd be happy to see any of these win...except Spielberg. Yes, he's brilliant, but I did not see anything original in Lincoln. BotSW was ENTIRELY original and something about the movie...the way the story was told was incredible. But for what it's worth, Life of Pi was incredible too. I'd be happy to see Argo win it. And up until two nights ago, that would have been my pick. Then, I saw Beasts of the Southern Wild. That was, by far, the best movie I've seen all year. Argo was brilliant too, though. And I think that is a film the public can get behind. It was important, relevant and well made. It flew a little under the radar in the box office, but I'm so glad I saw it. It was intense. I'd be pretty furious if Lincoln won. What I do have to say about these films is...what a variety! To see a Quentin Tarantino film with a Spielberg film and a foreign film and an indie film and a rom-com and a war film and a musical! This was a great group of movies to watch, and it's always good to see the smaller budget flicks get honored too. These were all so good! It's hard to judge how one is better than the other when they're all so different! I cannot wait to see who wins! I would love to hear your picks and predictions. Even if you didn't see them all. Out of the ones you did see, who do you think will win? As you can see, I only predicted in the categories I could judge. What do I know about film editing or sound mixing? If you want to choose in those categories, please do! See all of the nominees here. If you link up today, you will be entered to win $15 to Fandango! (Yeah I bumped up the prize a bit) You can link up anytime this weekend before the show on Sunday night. 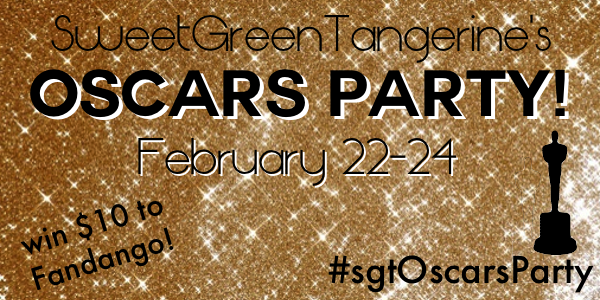 During the show, you can enter to win by tweeting along with me using the hashtag #sgtOscarsParty. Share a photo of yourself and your viewing crew or tweet your reactions to the show. Just know that I'm on CST meaning I might be an hour ahead of others. There could be spoilers if you're on the west coast. In order to win, please be a follower of my blog via GFC or Twitter. Thanks. We have almost the same picks! 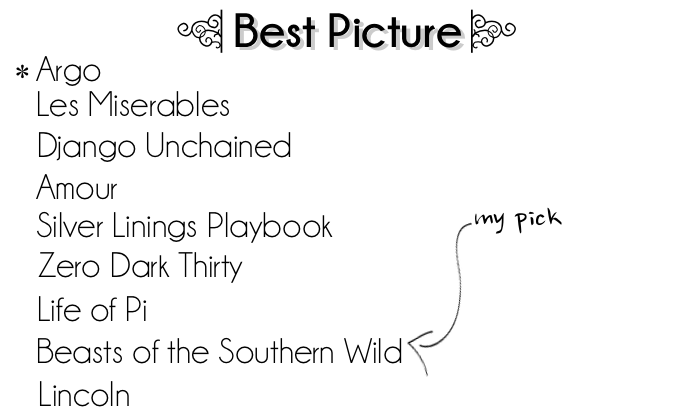 I went with SLP for best movie mostly because I loved the book! I'm really looking forward to all the musical performances this year. Good picks. I'm excited to see who wins big at the Oscars on Sunday. Oh man, this took me FOREVER to do. I've actually seen more movies than I thought I had, but I have no idea how the Academy picks other than... oh I liked this one. After reading yours I really wish I had seen Beasts of the Southern Wild now though. Maybe on DVD... or if it does really well tonight, they'll do an extended release in the theaters. I'm personally surprised The Dark Knight Rises isn't in there! I love all these predictions!! I really want to see a couple of movies now from watching the Oscars, mostly Argo! !